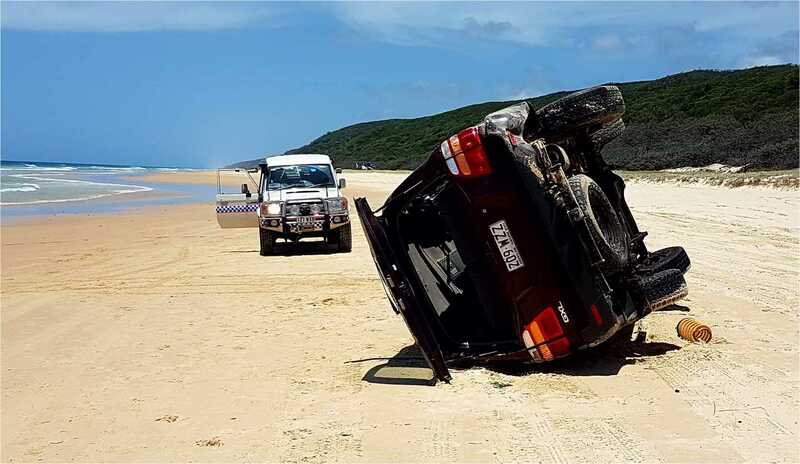 At about 9:55am on Sunday, January 14 a vehicle third in line of an organised group heading north on Eastern Beach, Fraser Island lost control and rolled over as a result of a wave that washed up the beach. The vehicle was travelling at approximately 60km/h in an 80km/h zone when the driver found themselves in the salt water wash. The driver of the vehicle has attempted to turn out of the water and as a result of the vehicle hitting the water and the sudden movement of the steering wheel, the vehicle started to slide. Over-correction has then caused the vehicle to fishtail and eventually roll two times coming to a rest on its side. It is important for drivers to remember that dropping tyre pressure to drive along a beach will change the entire balance and handling of the vehicle. In this instance the driver turning the vehicle sharply to avoid a wave resulted in the vehicle rolling over. All persons in the vehicle managed to exit. One female suffered a sore back and neck and was subsequently flown off the island by helicopter to Hervey Bay for precautionary observations and further examination. Police remind drivers of the importance of driving safely on open beaches as conditions are unpredictable and change quickly. Drivers should be aware that driving near the edge of the water can result in unexpected waves and rapidly changing conditions.